Jon McCormack is an Australian-based electronic media artist and researcher in computing. He holds an Honours degree in Applied Mathematics and Computer Science from Monash University, a Graduate Diploma of Art (Film and Television) from Swinburne University and a PhD in Computer Science from Monash University. He is currently Associate Professor in Computer Science, an ARC Australian Research Fellow and co-director of the Centre for Electronic Media Art (CEMA) at Monash University in Melbourne, Australia. CEMA is an interdisciplinary research centre established to explore new collaborative relationships between computing and the arts. His research interests include generative art and design, evolutionary systems, creativity, visualisation, interaction, machine learning, L-systems and developmental models. 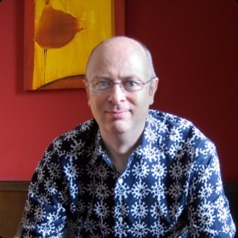 Since the late 1980s McCormack has worked with computer code as a medium for creative expression. Inspired by the complexity and wonder of a diminishing natural world, his work is concerned with electronic “after natures” – alternate forms of artificial life that may one day replace the biological nature lost through human progress and development. His artworks have been widely exhibited at leading galleries, museums and symposia, including the Museum of Modern Art (New York, USA), Tate Gallery (Liverpool, UK), ACM SIGGRAPH (USA), Prix Ars Electronica (Austria) and the Australian Centre for the Moving Image (Australia). He is the recipient of 16 awards for new media art and research including prizes at Ars Electronica (Austria), Images du Futur (Canada), New Voices, New Visions (USA), Alias/Wavefront (USA), The John Lansdown Award for Interactive Media (Europe/UK), and Nagoya Biennial (Japan). McCormack lead the team that was awarded the 2012 Eureka Prize for Innovation in Computer Science. The monograph, Impossible Nature: the art of Jon McCormack, was published by the Australian Centre for the Moving Image in 2005 and documents McCormack’s creative achievements over the last 15 years.